This week it was announced that one of the best buddy relationships in comic books would be making a comeback. Blue Beetle and Booster Gold will be coming to Justice League 3000, the series written by Keith Giffen and J.M. DeMatteis. The close friendship between Blue Beetle and Booster Gold was first established in Giffen’s and DeMatteis’s offbeat and often humorous Justice League (also called Justice League America and Justice League International at various points) in the 1980’s. During the Giffen/DeMatteis run on Justice League, Ted Kord (Blue Beetle) and John Michael Carter (Booster Gold) formed a deep friendship, based on joking, mischief, and some occasional actual super heroics. The “Blue and Gold” partnership, as it came to be known, turned into one of the closest friendships in the DC Universe. Later, Ted Kord was murdered by Max Lord, a one-time ally with the Justice League, during Countdown to Infinite Crisis. Even through the Brightest Day miniseries, which saw some “dead” heroes return, Ted Kord had stayed dead. However, that would seem to not apply to the “New 52,” which reset everything in continuity. Well, that would be true except that this isn’t a New 52 version of Blue Beetle and Booster Gold (Booster Gold debuted in the New 52 as one of the members of the Justice League International series that came out in the initial group of new debuts). Apparently, this New 52 version is not the Booster that will show up in Justice League 3000. The series may take place with the original Blue Beetle and Booster Gold from the Giffen/DeMatteis Justice League. In an interview with Newsarama, Giffen implied that the futuristic world presented in JL 3K is a future version of the pre-New 52 DC Universe. Giffen said, “So what does that have to say about what universe Justice League 3000 is taking place on? Maybe a universe where, if you went back and looked at Superman in the 21st Century, he might be wearing his underpants on the outside.” So fans should expect the classic Blue and Gold back again, at least in one title. 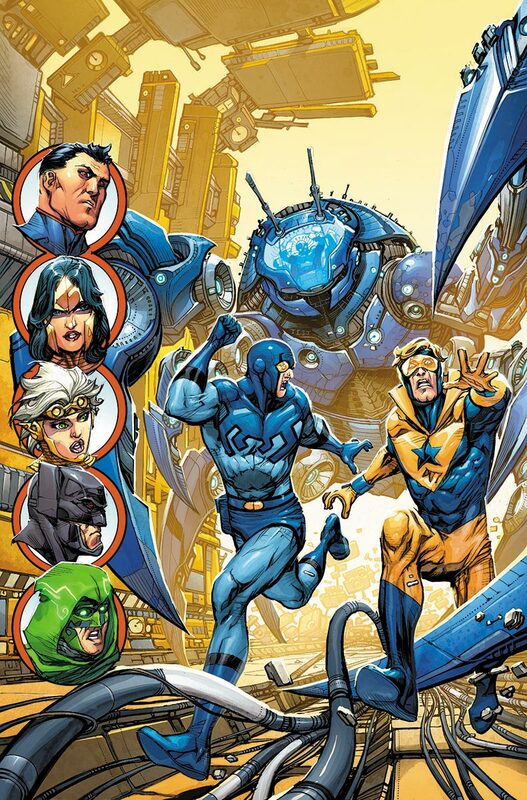 Blue Beetle and Booster Gold will show up in Justice League 3000 #12, due out in December.